I was born on April 10th, 1962 in Bolzano (Italy), where I still live. I started playing billiards at 5: I was not tall enough to play so I had to stand on a chair. My father Erwin, a real sportsman and a trade representative, was a very passionate carom player himself (8 national titles), and the President of the local billiard Club. He was the first and only real teacher I’ve had in my life. I played my first local tournaments when I was 8 years old, a kind of wonder child with runs of 30 caroms and more! At the age of 15 I began playing national and international competitions and on my first international appearance I won my first European medal (bronze) at the Junior Championship held in 1977 in Luxembourg. My General average was about 24,00 at the free game. A few months later, still at the age of 15, I won my first national title (not juniors!) in 3-cushion with 0,738 general average. Over that period I was focusing expressly on technical disciplines (balkline, one cushion) and I won 3 European Championships between 1983 and 1986. This year was also the time when I switched exclusively to 3-cushion billiards due to the convocation by Dr. Werner Bayer, founder of the BWA, to become a professional player in the newly created World Cup Circus. My professionalism started in the blink of an eye and is still going on today. 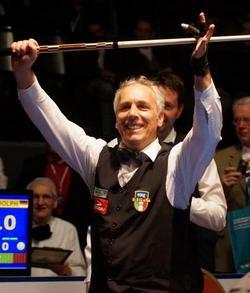 In my long career in 3-cushion billiards I’ve had the privilege to win every most important title and tournament: only a total World Cup is still missing in my list, as for the rest I catched everything. Among them, my most important titles are 4 World Championships and the gold medal at the World Games. I have a University degree in Economics (finished in 1988) and I do speak Italian, English, German, French and Spanish. I’ve been living with my companion Martina for 10 years now and we have a wonderful son born in 2008.